I broke a bone in my hand and, after a trip to the ER, was referred to a nearby Orthopedic surgeon and told to see him as soon as possible. Of course, he wasn't available and neither was anyone else with an office anywhere close. Apparently these docs all take vacations together. A friend suggested I call Dr. Richard's office and when I did they arranged to get me in on short notice as I was about to go away for a week and really needed to have it looked at. I was a bit panicked because I thought I might need surgery and am really grateful that I didn't have to spend a few weeks worrying about it while waiting to get in somewhere. Even after squeezing me in, I had barely had time to fill out the forms (tough with a bad hand) before they brought me back to see Doctor Richards. He checked my hand and the ER x-rays but then took a few more - and it turns out there was a second fracture the ER x-rays hadn't identified. They took off the temporary splint from the ER and Doctor Richards put a new cast on while explaining the injury and what I should expect going forward. He scheduled a follow-up for a change in cast and gave me info to set-up Physical Therapy afterward. Doctor Richards is both friendly and efficient, as is his staff, and he certainly knows his stuff. He made sure I was comfortable with everything he was doing and took the time to answer my questions and make sure I understood it all. A great experience all around - I highly recommend him. I thank God daily for Dr.Joshua Richards because he wasn't the type of man who just wanted to preform surgery right away! Instead he asked many questions. Then he listened carefully while giving direct eye contact reassuring the patient that he understands what your saying! Dr. Richards then discuss various options ,plan of treatments, risk factors etc. with you & always says you dont have to make your decision right away. The surgery on my left had was Carpal tunnel & De Quervain Release which was extremely needed & now my hand is feeling YA! Whoooo! wrist and thumb pain-free! I highly recommend Dr. Richards if your looking for honesty, highly qualified, and someone who cares about your quality of life instead of how much money you have or community you live in. Dr Richards did my elbow surgery and did an amazing job... I'm able to play sports just like before. Defiantly a great surgeon. My daughter broke her finger playing soccer; the fracture involved her growth plate. Since she is only 12 years old, it was imperative that it heal properly. Dr. Richards was amazing with my daughter and I... he was very thorough, gentle and kind. I had complete confidence in him and so did my daughter. She needed surgery to fix the fracture... he rearranged his schedule to fit her into his surgery schedule. My daughter could not have received better care. Along with his unsurpassed bedside manner, he is a perfectionist!!! He reviewed the x-ray's with me following her surgery; the bones aligned perfectly. She was followed very closely by Dr. Richards and his staff following her surgery and is now doing great. She has full movement of her finger; it is as if there was never any injury to her finger at all. I truly cannot say enough about Dr. Richards; so knowledgeable in his field and so caring!!! I highly recommend him!!!!!! TRULY A WONDERFUL DOCTOR WHO CARES FOR HIS PATIENTS! I am a dancer/performer in the Hamilton: An American Musical 1st National Tour and recently experienced a hairline stress fracture in my right wrist while performing in a show at SF's Orpheum Theatre. I was recommended to see Dr. Joshua Richards at Webster Orthopedics in Oakland. Right from the get-go, Dr. Richards was incredibly diligent, caring, knowledgeable, and proactive in getting me an MRI, diagnosing the injury, and prescribing me hand therapy/acupuncture as fast as possible- so that I could get back on stage as soon as possible. He was so comprehensive and patient with me, making sure that I knew everything about my injury, and was so responsive whenever I had questions about my treatment and recovery level. As a professional dancer, I highly recommend seeing Dr. Richards! Back in the saddle! As a 60 yr old horsewoman I am thrilled to be back doing what I love after a fall and breaks to both my humerus and wrist. Dr Richards performed surgeries on both breaks and achieved excellent results. His staff provided great support and were very responsive and instrumental to my healing process, assisting with insurance paperwork and employer notifications as well as being very caring and helpful to me. As a longtime local RN I can appreciate an efficient, professional team. Highly recommend. I have been seeing Dr. Richards for over 5 years. He patiently treated me with several options prior to having surgery on my Left thumb joint in 4/16. I am now prepared to have a second surgery on my Right thumb joint. My first surgery was a 100 percent success with full motion and strength returned. Dr. Richards office staff is top notch. Always responsive, supportive, patient and kind. I have recommended him to several people with ARTHRITIS who didn't even know there was a surgical Procedure that could help them. Great bedside manner! Phenomenal physician! Very knowledgeable. Recommend to all my loved ones. A trauma left one of my fingers (on my dominant hand) fractured in 5 places and severed a tendon, which retreated to my palm. When I met Dr. Richards, he was very direct and to the point while explaining my injury, and letting me know that I needed surgery, but he took time to walk me through what I could expect, what the pain would be like, and the fact that I would end up with a button temporarily sewn to my finger to hold the tendon in place until it healed. He also said, "I am sorry this happened to you," which as it turned out, I really needed to hear. He scheduled surgery right away, spent 2.5 hours putting my finger together, and made sure I got a hand therapy appointment scheduled right away. Everybody can be nice; being kind is harder - it means saying what is necessary for the health and welfare of the person, not just what the person wants to hear in the moment. Dr. Richards is kind, which in my case meant getting upset at me for not focusing on my hand exercises. The tough talk motivated me to try harder; I didn't want to disappoint him and I wanted to care about my results as much as he did. I trust him and am grateful for his care. I saw Dr richards for my shoulder a few weeks ago. It was a great experience and his new oakland office is very nice. The lady at the front desk was very friendly and his back office staff was great. Dr. Richards recommended a shoulder injection for my long time shoulder pain.. I was able to get the injection the same day and I have had little to no pain ever since. I am able to do daily activities that used to cause me pain and now I do it pain free.... I would recommend Dr Richards to anyone who is having any shoulder pain. On behalf of C. Goodwin: After suffering many years with carpal tunnel, Dr. Joshua Richards of Webster Orthopedic performed carpal tunnel surgery on both of my hands. My hands, while still healing, have never felt better. Dr. Richards performed both of my surgeries flawlessly. I remained awake during surgery and released to head home shortly after he was done. Dr. Richards has been very professional and honest with me throughout the process and my post-surgery appointments. I am very satisfied with the professionalism of his office staff and Dr. Richards himself. I would highly recommend Webster Orthopedic and Dr. Richards to anyone in need of their services. While I was not a patient of Dr. Richards, I had a very positive experience with him while dealing with my dad's ongoing health issues. My father is often not the easiest person or patient to interact with but Dr. Richards was extremely patient, funny and communicative. He helped me to better understand my father's situation, stayed in constant contact with me and put me at ease overall. I am extremely grateful to Dr. Richards for helping me feel supported rather than confused and helpless, which can often be the case when dealing with a loved one in crisis. Thanks Dr. Richards! Over the last two years I have seen Dr. Richards twice. Once for a bicycle accident; and the second time for my daughter with a broken wrist. I have unfortunately spent a lot of time in doctors offices over the years, from this I have developed an opinion of what makes a good physician, or at least one that I would want to work with and take my family members to. Josh meets these requirements, he is professional, knowledgeable, and most importantly willing and able to engage with his patients to discuss all aspects of the injury/issue and the potential treatments. I have really appreciated his cautious yet pragmatic approach to treating my daughter who is currently on an injury bender. If you want to see one of the best doctors in the area then I suggest you reach out to Dr. Joshua Richards. Dr. Richards performed a total shoulder replacement for me less than 3 months ago. I am 69, have osteoarthritis and am not ready to give up my active life style that includes working out at the gym with a personal trainer many times a week. I am so glad I have had this surgery. It has been a very fast recovery, minimal discomfort requiring Tylenol occasionally, working with a physical therapist and a commitment to doing daily exercises as prescribed. The physical therapist is constantly saying my progress is months ahead of that of other patients he has seen with the same surgery-- especially, in regards to the movement in the shoulder joint. Clearly, this has to be a result of having chosen a fantastic orthopedic surgeon for this procedure! This type of procedure does indeed require a longer period of rehabilitation than 3 months. I fully admit this, but I feel wonderful and can do everything I need to do in daily life without difficulty as long as it does not involve heaving lifting. Right now, I am ready to finish with PT in a couple of weeks and continue strengthening on my own at the gym. I know Dr. Richards' office is listed in Berkeley, but I live in Livermore and was able to see him in Dublin. Ashley Levy, PA works with Dr. Richards. She is can answer any question you come up with and a wonderful person. I have seen Dr. Richards for other problems and another surgery. He is an excellent physician, very pleasant and respectful. I love his quiet sense of humor. Dr Richards is an excellent doctor. He and his crew got me through carpol tunnel release surgery. The staff are incredibly nice and everything was great. I would recommend him in a second. I am so impressed with Dr. Richards and his staff.Ashley Levy ,his assistant is outstanding. What a jewel.They work well together.She was there for my procedure easing my anxiety. She actually diagnosed my carpal tunnel in my right hand and sent me to a neurologist. Her caring manner,knowledge of medicine,ability to explain the procedure giving me all the necessary choices for treatment helped me .She is a keeper. What can I say other than Dr. Richards ROCKS!!!!!! I went to Dr. Richards in April 2010 for a second opinion on a difficult to diagnose problem with my left hand...... Dr. Richards thoroughly explained my options, risks and benefits of surgery, listened and gave me adequate time to answer all my questions and concerns. Surgery was scheduled; and after my pre-op appointment with Dr. Richards I knew what to expect at the surgery center, and post-operatively. Surgery went smoothly and I am happy to say because of Dr. Richard's expertise and knowledge I am getting the strength back in my left hand. I would not hesitate to recommend Dr. Richards to anyone......... THANK YOU SO MUCH Dr. Joshua Richards!!!!! When I broke my wrist and was told that I would need a hand surgeon, Dr. Richards was able to see me right away. He scheduled me for surgery the following day. Had I waited a few more days, surgery would not have been an option and I would have lost 20% use of my wrist. He and his entire staff as well as the surgery center (Alta Bates), nurses and anesthesiologist were top notch. Dr Richards and his staff has been wonderful in caring for me post op and communication on health loop has been a life saver in my recovery. This is my first shoulder surgery and the care has been exceptional. Every aspect of my association with Dr. Richards and his office has been positive and professional. Setting aside the expert job he performed on a rather complicated wrist surgery, he is a polite and respectful man who answered all of my questions thoughtfully and carefully and every member of the staff falls in suit. It's clear to me that this organization cares about patients both physically and emotionally. Dr Richards recognized an urgent situation and made room for my surgery in a very busy schedule. His level of confidence, experience, and sympathy were very welcomed. Dr Richard's staff is wonderful, skilled, and accessible when needed. All together I got the TLC I needed in an efficient and timely manner, and am well on my way to mending. Very professional and yet he is very personal. Dr. Richards is skilled and very competent. I would recommend him to anyone. I have have two surgeries by Dr. Richards--trigger finger release and total shoulder arthroplasty. Excellent results and care with both. I appreciate working with both Dr, Richards and his PA Ashley. My experience with Dr. Josh Richards shows: Dr. Richards focuses on the immediate problem, answers your questions clearly and provides the solution. Hand surgery and shoulder surgery to date, will I be back...absolutely. Believe me Dr. Richards is good because we drive from Lake Tahoe just to see him. Personal, terrific and knows his stuff....great Doctor! I was referred to Dr. Richards in February 2016, after suffering work-related injuries. Dr Richards and his professional staff walked me through the preparation & healing process to each Carpal Tunnel and Trigger Finger release procedure. To-date, I have had 3 successful procedures. Thank you Dr. Richards, PA Joel ... and Administrative Staff. "Webster Orthopedics - San Ramon Office - I have never walked into a doctors office for a 1st appointment feeling like I was someone they have known forever. This started with the woman who greeted me at the front desk, another who was helping someone else but took that second to greet me, to the woman who took me to a smiling X-Ray Tech, and especially Dr. Richards, who didn't look at a clock and wanted to make sure I understood what he had told me and was so patient at any question I would have asked. Each individual (and there were others that walked by) smiled, greeted warmly and made me feel special...Amazing, looking around - they did that with everyone!!!! BIG KUDOS to the staff at the San Ramon Office - IMPRESSIVE IS AN UNDERSTATEMENT! Still smiling....thank you!" "Quick, painless, effective in a friendly environment; what else could you ask for!" "Dr. Richards, Ingrid, Sanjeev Joshua. What a breath of fresh air. I have been in pain for over 3 1/2 months without much help with bedside manner. I arrived at Webster Orthopedics with the most generous care and smiles. The doctor took his time and notified me he had to be in surgery soon and didn't rush me out of the office. I feel very cared for here and that warms my soul. Thank You! I know I am in good hands." "Excellent staff!!! You guys are the greatest." "My overall physical health and conditioning is extremely important to me. Prior to making any doctor/specialist appointments, I thoroughly research both the medical issue/circumstance that I face as well as the available doctors/specialists in the applicable field. Recently, I ruptured my proximal bicep tendon. As a result I began experiencing increasing pain from an old shoulder separation as well as an elbow dislocation. 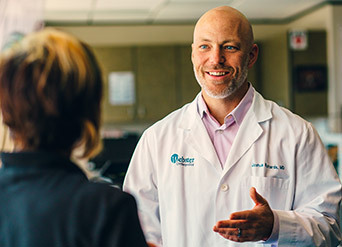 When exploring the possibilities, my primary goal was to find a doctor/Orthopedic Group that could potentially investigate the various medical issues from a holistic perspective and not just treat the individual symptoms by themselves. When Dr. Richards met with me, he spent a significant amount of time both learning about me as a patient and understanding the specific medical issues that I felt were relevant to my condition. As a result, we agreed on a treatment plan that holistically provides me the greatest recovery possibilities with the least associated risks and/or potential complications. I am very pleased with the treatment path and feel Dr. Richards empowered me with all the necessary tools to optimize my recovery thus allowing me to return to a full and active life. As a side note, it happened that Dr. Richards was a professional colleague of the knee specialist (Dr. Scott Dye)that recently resolved my knee complications without major surgery. Many thanks." "Awesome, being treated with such warmth and kindness. That made all the difference on days where I thought I couldn't go much further. Just a smile made my painful day a bit easier. Thank you Bernadette and Ingrid." "I'm very pleased with the care I have gotten at Webster Orthopedics. The staff is loving, caring and understanding. I am a new patient and I was treated like I've be coming here my whole life. Moheene, Bernadette and Sophia are the first one's you see when you come in. You forget you are in pain because they make you feel great. You know that you came to the right place. Dr. Richards PA Sanjeev is on the ball, making you feel cared for. My experience was awesome. Thank you." "It was very professional and lots of kindness shown through the surgical procedure. Thanks to all of the medical team. I always feel respected and loved." "Accidents do happen! And in my case, I can vouch that accidents happen to even the best of us. As I was flying to visit a friend for the weekend, I decided not to check in my baggage figuring I'll just carry on. Being that I am not the strongest or tallest person, I was overextending my arm and trying to push my luggage into the compartment. POP..Squish!.. then the pain. I had ripped a muscle completely off the bone. Upon returning from my horrible weekend, I met with Dr. Joshua Richards. He performed my shoulder surgery with ease and exquisite care. The procedure went exceedingly well. The follow ups with his office were frequent with no details left unwanting. It has been a year since my surgery and I have full and complete use of my arm. Thank you Dr. Richards for your expertise and care. Now I am able to get back to the activities that I would never have been able to do without your help." "Very professional from the time I arrived. The wait was within reason. Sanjeev reviewed my case first and he was very thorough and easy to talk to. He made me feel comfortable and in good hands. Dr. Richards was equally thorough explaining all of my options as well as recommendations with a good follow up plan. I would recommend this office without reservation. Many thanks!!!" Read to what our patients been saying about their hand, wrist, elbow and other orthopedic surgery. Take a look at Dr. Richard's YouTube channel, where he talks with patients and reviews interesting cases. Reach, watch, and listen to grateful patients who have sought out Dr. Richard's for a second opinion. Read written testimonials and hear audio comments from children (and their parents) who have come to Dr. Richard's for their hand and arm injuries. If you're interested in submitting a testimonial for Joshua C. Richards, MD, Please use the form below to do so.